With companies growing, and telecommuting becoming more and more commonplace in today’s business world, companies need a way to keep their personal data secure. Sending information from home based workstations, smart phones, and branch offices requires privacy to protect your valuable corporate data. You could set up a network of dedicated leased lines, which would ensure security and privacy, but that gets expensive quickly, maybe prohibitively so. Just sending your information unprotected over the Internet is too high a risk. Who knows what may be happening to your critical data once it leaves your office. The solution? 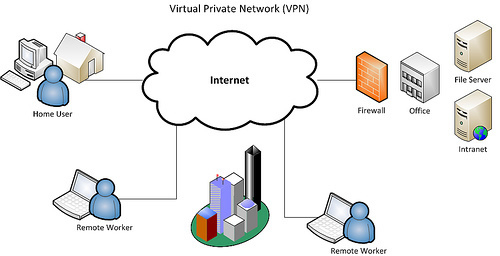 A Virtual Private Network (VPN). A VPN is a network just for your company, with unbreakable security and total privacy that allows your employees working somewhere other than the head office to send sensitive data to and from your corporate headquarters, worry free! At SwitchWorks, our VPNs set up secure nodes at every location you need, with ironclad encryption for any data needing transmission back and forth from your employees. Whether they’re working from home, on the road, or at a remote work station, put your worries to rest with our customized VPNs! It’s affordable, it’s safe, and it will help you grow your business quickly and safely. Allow our knowledgable technicians to configure the ideal network solution for your company, by assessing your requirements, and making sure you have the correct answer to all your privacy needs. Ensure you get the correct ratio of upload:download speed, the right kind of encryption, even the right security protocol for your networking needs. At SwitchWorks, we can have your company wired in the most simple and economical way possible, so you can get busy building your business. Call our VPN specialists today!